John Steinbeck was born in Salinas, the centre of the Californian lettuce industry, in 1902. He was of German-Irish ancestry. His father, John Ernst Steinbeck, was county treasurer and his mother, Olivia Hamilton, a teacher. Steinbeck attended Salinas High School and then went on to study marine biology at Stanford University, although he never took his degree. He travelled to New York where he worked as a reporter, but was fired. He then took odd jobs including hod carrier, apprentice painter, caretaker, surveyor and fruitpicker. His first novel Cup of Gold (1929), was an historical romance based on the life of the Jamaican buccaneer, Captain Henry Morgan. In 1930, he married for the first time, Carol Henning (they were divorced in 1943). He was to be married twice more, to Gwyn Conger in 1943 and Elaine Anderson in 1950. It was with his 1935 novel Tortilla Flat that Steinbeck won popular attention. In this and subsequent novels, he continued to write about America's dispossed rural folk. Steinbeck had a journalist's grasp of significant detail and his novels reflect this. Of Mice and Men was published in 1937. The 1939 novel The Grapes of Wrath was a Pulitzer prize winner and was made into a classic film in 1940. It awakened America's social consciousness and, for this reason, was compared to Harriet Beecher Stowe's Uncle Tom's Cabin. 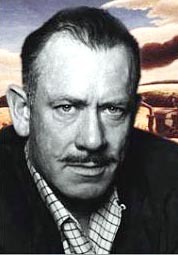 During World War Two, Steinbeck became a war correspondent. Later he was to get special reporting assignments abroad. Steinbeck was controversial because of his support for the underprivileged and he did not receive much acclaim for his later novels. He suffered a long period of adverse criticism in America, but remained popular in Europe. In the 1960s, he made a tour of 40 states of the USA with his poodle, publishing Travels with Charley in search of America (1962) as a result of his journey. In the same year he was awarded the Nobel prize. He died in 1968.